Well I did it - I finished my Stack n Whack top annnnnnnd even finished quilting it. I know I won't get the binding on for a little bit. This part always slows me down! But here it is - I made it out of animal prints - and quilted it with Quilters Dream Puff batting - it is so soft and comfy and warm!! Today was a basketball day - we played in Johnstown, and battled just a little bit of snow, but man am I snow shy. The second that snow started coming down I drove the vehicles to the highway and parked there - no more snowed in junk for this girl! I will hike the 1/2 mile to guarantee we are not stuck!!! Finally my Lasagna Quilt is finished. I very enthusiasticly cut strips for one twin size lasagna quilt, but when i started sewing I realized that I had cut enough for 3 quilts. 1 set went to a lady who makes comfort quilts, she sewed them up. The first finished quilt went to Houston for victims of Hurricane Katrina, and then there was this one. I oh so kindly put it in a bucket, stacked it on a shelf - and promptly forgot about it! When I was moving my sewing room around I unearthed it, quilted it, and then put it in a bin for binding...fast forward to January - it became my goal to get it bound and Finally I am Finished with it. 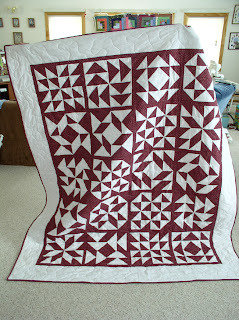 This pattern is from "Atkinson Designs Spring Cleaning book" - Its a really easy quilt, a great stashbuster too. I quilted it with tons of hearts all over it. 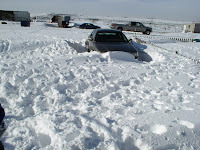 We have been plowed out now, but this morning as I tried to get the one car that had been stuck out, it argued! It slid everywhere, so I very promptly parked it and decided it would hang out until the spring thaw! I am very wholeheartedly looking forward to a thaw - at some point in the near future LOL. Well We needed moisture, the pastures needed moisture, but I really didn't expect we would ever get this much snow. When the temps are in the 30's its a blast, but with the wind and biting cold, last week we were a "Leeeetle" crabby. Saturday evening we came home to 2 more inches of snow, and Sunday it dropped another 6 inches on us. Now we already have drifts of 4-6 feet eveywhere. Driving down our road feels like a tunnel. From a formerly warm land person this is amazing to me. My Car had been snowed in, and 2 weekends ago DH managed to dig it out, so the hole that it left we used as a walkway. Well Saturday the walkway was no more, the wind blew it shut. We have been trying to keep it shoveled - but it has gone from 7 feet wide to 2 feet wide....Where my DH is standing used to be where my car was stuck. We have been working as subcontractors ;-) We were sent some great 4 Patch blocks from Marianne and we got them put together into a top. I have some Navy Blue in my bucket and the kids thought that would make a nice border. So it is on it! I washed and pressed some muslin - so will be putting the backing together soon and will get it quilted. I see a Flurry of Angels type quilting on it - so will see what everyone else thinks . We learned a lot about 1/4 inch seams!! 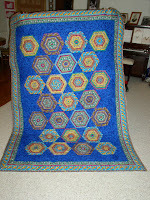 This is a great quilt one of my customers brought me - I really like the look of it, and like the colors she used. 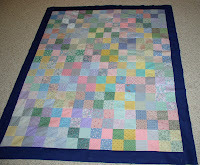 I think its a great idea for a scrappy quilt with less control as well. We had our guild meeting last night and had an excellent speaker on How to do Borders and Binding. She even showed us how to do mitered borders. I took a class from her last year - so it was great to hear her again. Laurie is her name and she teaches at the Quilters Stash in Windsor CO. 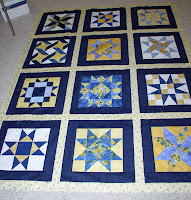 I have been busily working on my Stack N Whack quilt. I got it quilted and my goal is to bind it before I post it here - Incentive right?? One of my January goals was to finish a UFO - it was a Block of the month Star quilt from the Quilters Stash in Greeley ( now they are in Windsor) . I had finished all the way to November then put it in a bag ( gasp!) So I got it out and when I did I found that I had purchased 3 different border fabrics for it, as well as a few extra FQ's - My And now I know how my fabric stash grew!!! We are still snowy here in Colorado. Since we need 4WD to get up and down the lane - DH gets the truck and the kids and I get to st ay home. This has really helped me to get stuff done, and not be stressed about it. Too bad school starts Monday, and we have a funeral to go to in between. Oh well - I can't get too lazy now can I? This is my little car - stuck up by the house - It is snowed in and I think it might be retired for the winter. Maybe I will commandeer the Pick up and make DH walk some where!! This is our beloved Grammy Ida - she is my husband Gramma, and we love her. 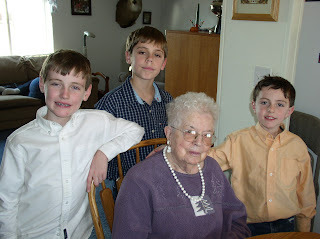 She is pictured here with my boys. We were at Thanksgiving in Thermopolis WY. She made it thru the New Year and passed peacefully in the night on January 1st. She will be missed. Her husband is in heaven waiting for her, and I am sure it will be a joyous reunion. She is my Gramma in law, so I have only had the priveledge of knowing her for a dozen or so years. But the stories that have circulated - this woman was an amazing person! She and her husband were the Bullwhackers that led a team of oxen on a 4200 mile trip opening the Hwy US 40. She was 21 and newly married. Joe and Ida May ranched in the Douglas WY area, and she told me of a failed water well. So instead of having water easily accessible, she hauled water from a neighboring ranch to take care of her family. 3 little kids and the ranch - she is quite the woman!. AND they did not have disposible diapers back then!! We will miss her a lot. I loved the stories she told, and the way she loved my kids.